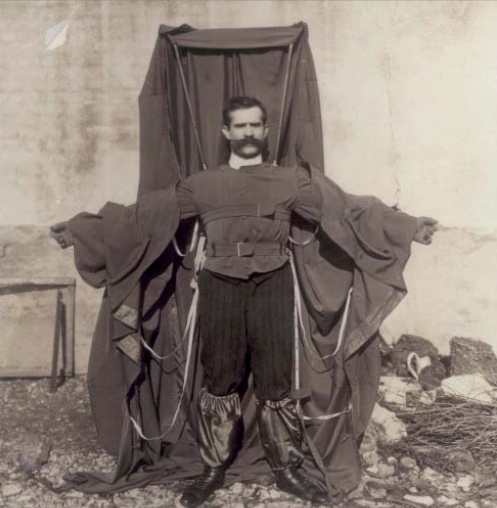 Franz Reichelt… recognize the name? I didn’t think so. In 1912 this tailor from Austria living in Paris thought of a brilliant contraption that would allow aviators to escape from their aircraft and fall harmlessly to the ground … pretty much an early model of the parachute Franz was no idiot he supposedly successfully tested one of his model suits multiple times using a dummy and his fifth floor apartment window. Apparently he was sick of this child’s play and petitioned the French police to allow him to conduct tests from the first observation deck of the Eiffel Tower. After denying him a few times they consented. When he showed up on the day of the test the police were surprised to find out that he intended to do the test without the dummy and jump from the deck himself. His friends and the police were unable to talk him out of it so the test was conducted … here are the results. As you can see things didn’t go well for Franz. Although he was clearly dead he was taken to the hospital and pronounced dead there. Before he created a foot deep impression on the frozen Paris ground do you think he regretted jumping or was he resolute that his invention would work until moment of impact? Well if he did think it was going to work he was wrong. The 120 foot fall was apparently too much for his little cloth wings to handle. Many may not think he was the smartest guy around but you have to respect his balls. As he was standing up there you could tell in the video he wasn’t quite sure whether to jump or not but with the news and a big crowd there I guess he didn’t want to wuss out. Sorry Franz but good idea. ~ by chj48 on February 1, 2010.